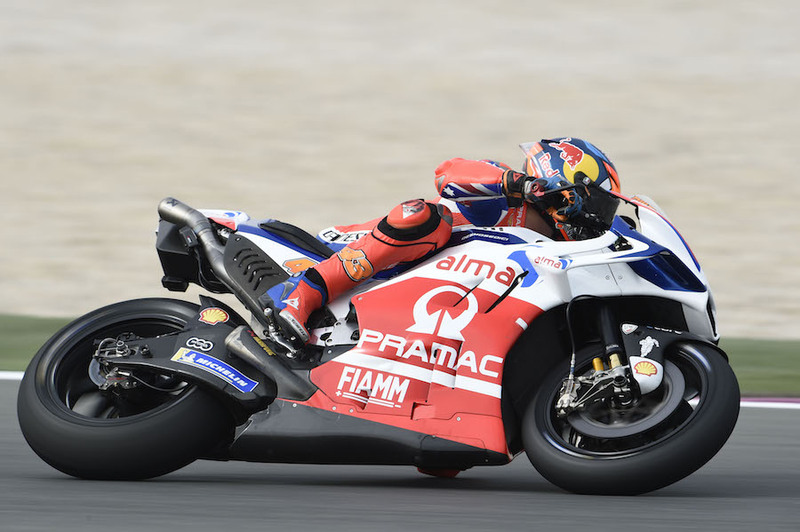 A ten-year-old record, set on soft qualifying tyres, went flying in an explosive first qualifying session of the year, with three riders inside the time, and two of them not even in factory teams. And the best was on a two-year-old non-factory bike. 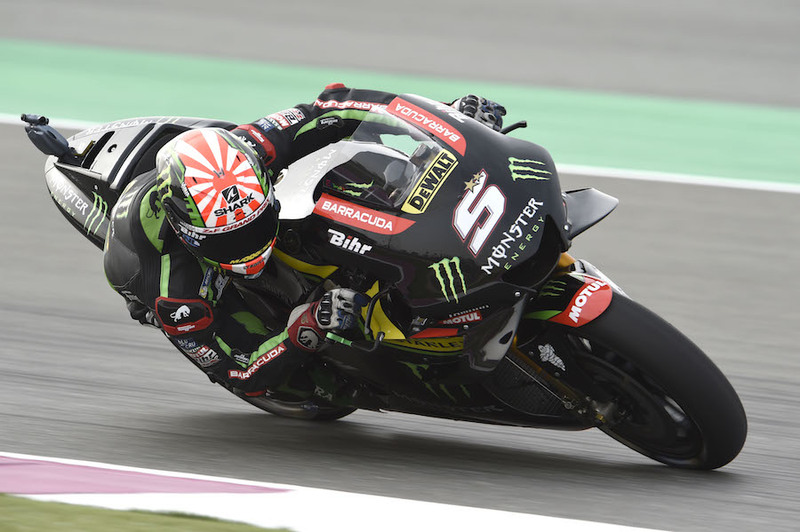 Johan Zarco made a sensational MotoGP debut here last year, leading the early part of his first big-bike race until he crashed. Now the independent Tech 3 Yamaha rider underlined the growing strength of his challenge with a stunning first pole position of the season. 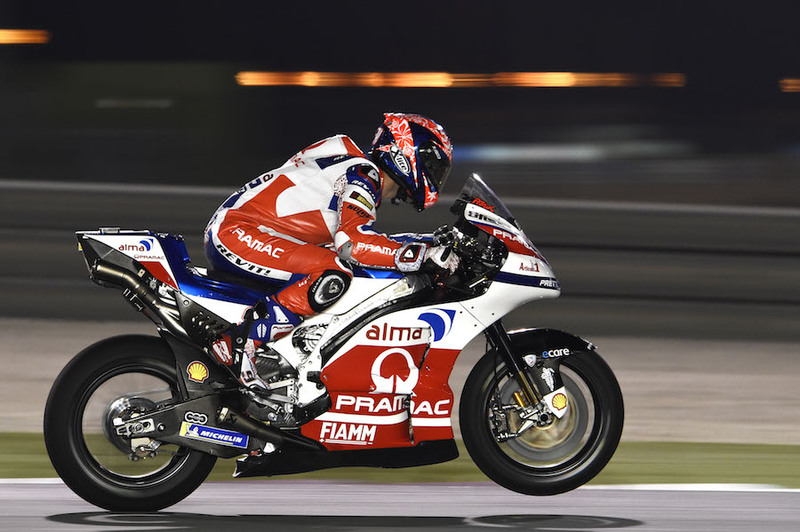 He not only outclassed defending champion Marc Marquez (Repsol Honda) and Pramac rider Danilo Petrucci (Ducati GP18). 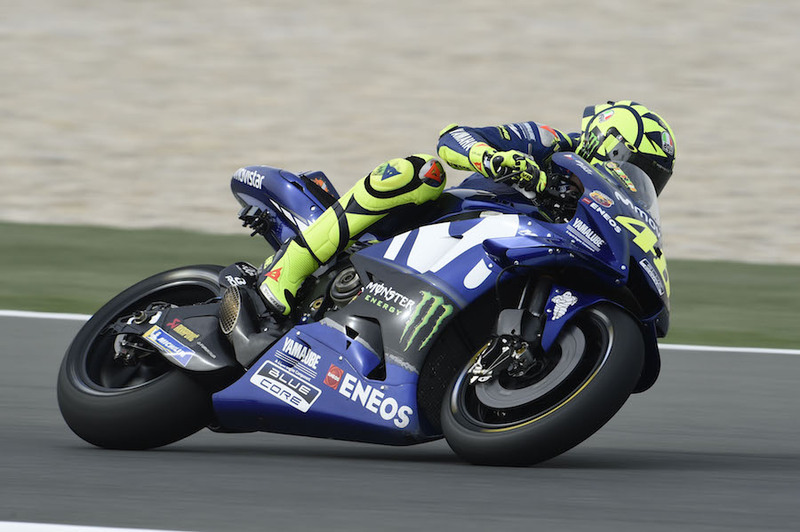 Riding a two-year-old 2016 Yamaha M1, the Frenchman effectively humiliated the factory Movistar Yamaha riders, with Valentino Rossi eighth, in the middle of row three; Maverick Vinales 12th, the slowest rider in the elite Q2 session, having had to fight his way through from Q1. The top three were all inside the 2008 circuit best lap, set on a Yamaha by Jorge Lorenzo, back when one-lap qualifying tyres were in use. This was in spite of gusty wind, and a layer of sand, leaving visible trails when riders were off line, after a nascent sandstorm earlier in the afternoon. Zarco’s 1’53.680 was two tenths ahead of Marquez, with Petrucci just another five thousandths slower. The times came at the end of an all-action 15 minutes, with several other candidates for the front row. 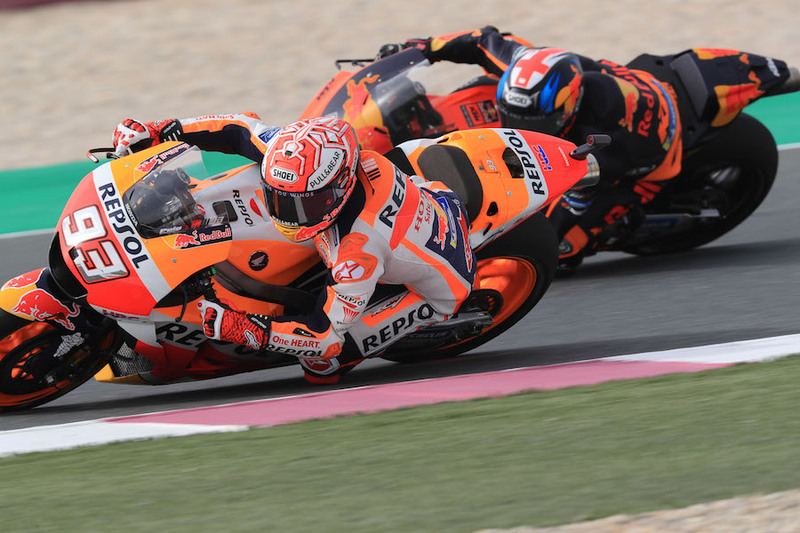 Dani Pedrosa had been another possible, but ended up heading row three, left trailing by seven tenths. Rossi and erstwhile session leader Jorge Lorenzo (Ducati completed the row; Jack Miller and Vinales, both through from Q1, straddled Andrea Iannone’s Suzuki on the fourth row. Marquez was also happy, but apprehensive about tyre wear on the abrasive track. “The first and last laps will be very important,” he said. Miller was “dumbfounded” to find himself tenth after having been fastest in Q1, then going even quicker in Q2, barely 0.76 off pole. “When I saw my time I expected I’d be a lot higher,” he said. But he was looking forward to his first Ducati race. “I really like the bike. With the old one, I was lucky if I could do two fast laps in a row, but this is much easier” he said. Alex Marquez opened his Moto2 account with pole position in a close Moto2 session, with a dozen riders within one second, and some surprising names up at the front. The Marc VDS rider is joined on the front row by a late-charging Lorenzo Baldassarri, with last year’s top rookie Pecco Bagnaia making it three Kalexes up front. The surprises were just behind. Fourth-placed Miguel Oliveira (KTM) was tipped for better after winning the last three races of 2017; he was more than half a second off pole pace. Alongside him, class rookie Romano Fenati (Kalex), and former Moto3 champion Danny Kent, riding a Speed Up. Fenati’s victor in last year’s Moto3 championship, runaway winner Joan Mir, ended up down in 24th. Jorge Navarro leads and all-Kalex row three from Mattia Pasini and Marcel Schrotter; Sam Lowes placed tenth on the KTM on his comeback ride from MotoGP, after a tumble earlier in the session. Former race winner Nico Antonelli took the first qualifying honours of the year for Honda in Moto3, snitching his first pole position since 2016 with a canny slipstreaming move at the end of the session. He denied fellow Honda rider Jorge Martin, ten times on pole last year. The Spaniard had dominated the session and put in a flyer of his own … but without the benefit of a slipstream he fell short by a barely measurable thousandth of a second. They will be joined on the front row by Gabriel Rodrigo, the KTM rider a frequent fast qualifier last year; but Honda appeared to hold the high ground, with seven of the top ten. Row two will be led by two Hondas, with Ayamu Sasaki following Martin to claim third (both former Red Bull Rookie champions); and a second Japanese star, Kaito Toba next. Sixth went to new KTM rider Marco Bezzecchi; last year’s star Aron Canet (Honda) leads row three from Philipp Oettl (KTM) and Lorenzo Dalla Porta (Honda). Enea Bastianini (Honda) topped FP1 and was threatening for the front row when he ran wide on the final lap, ending up tenth.